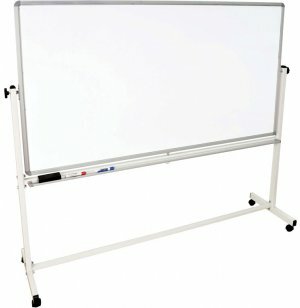 This large Reversible Magnetic Whiteboard gives you plenty of space for taking meeting notes or doing sample problems. With a separate whiteboard on each side, you donâ€™t have to worry about constantly erasing to make more space. 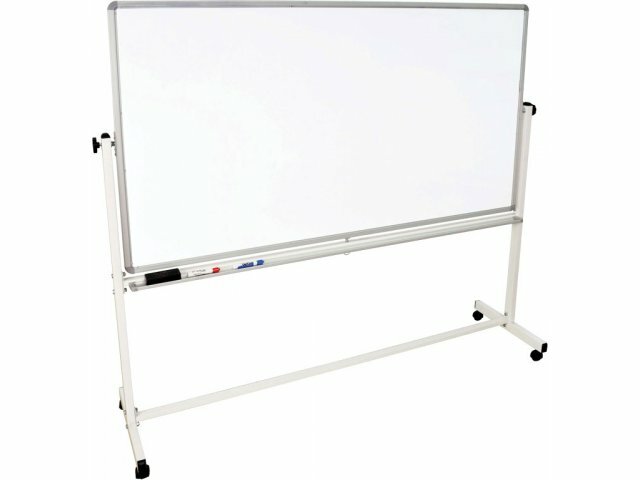 Double–sided magnetic whiteboards give you twice as much space for writing notes and doing board work. They will make a convenient addition to any classroom or office. These portable boards easily roll to any location. They are surrounded by a tough aluminum frame with an attractive white paint finish on the outer frame. Need more space to write but don’t want to erase previous work? Simply flip the magnetic whiteboard over to get to a clean writing surface. When you want to return to previous notes, simply flip the whiteboard back and everything is right where you left it. Two magnetic sides create a convenient place for hanging class lists or announcements. A built–in marker tray keeps markers and erasers within easy reach. Abundant Space: A two–sided board provides twice as much writing space, so you can just flip the board over when you run out of room. Easy Mobility: Rolls into position on four casters, so you can transform any room into a classroom. User–Friendly: A convenient tray keeps markers and erasers accessible. Multipurpose: Magnetic surfaces can also be used to hang announcements or lists.